wer treatment targets are currently being explored. deposition in the myocardium leadin g to fibrosis [29,30]. meability, and impair fibrinolysis [35,36]. and VEGF-R2 as suggested by animal studies. extension and congestive HF after MI in these patients. interstitial fibrosis and HF [43 ]. tween the E/A ratio and autonomic neuropathy . resulting in increased oxidative stress and fibrosis . into 4 stages depending on the symptoms. 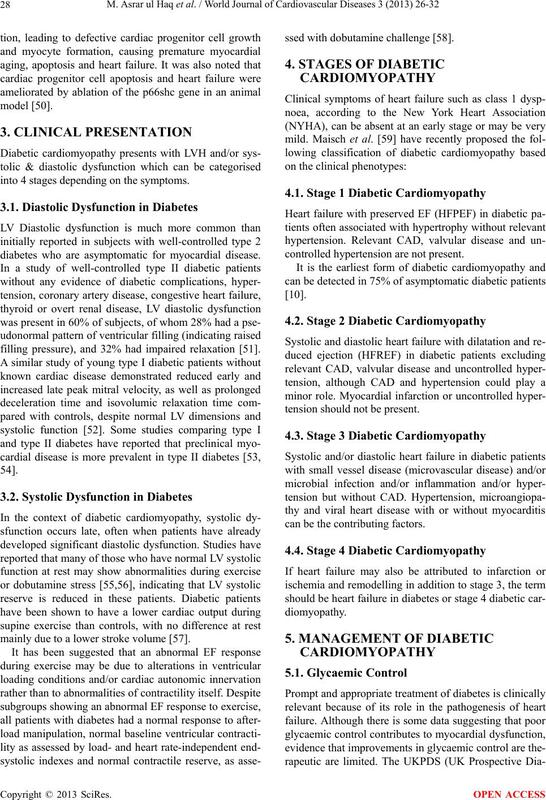 diabetes who are asymptomatic for myocardial disease. filling pressure), and 32% had impaired relaxation . mainly due to a lower stroke volume . ssed with dobutamine challenge . controlled hypertension are not present. tension should not be p resent . can be the contributing factors. merit consideration when interpreting the results . mm Hg reduction of systolic blood pressure. effects on cardiac hypertrophy and fibrosis [72,73]. zymatically cross-linked to form matrix. companied by imp rovement in ca rd i a c f unction [ 7 4]. ty acid metabolism (e.g. trimetazidine). nists currently remain the mainstay of therapy. ate Medical Journal, 84, 188-192.
options. American Journal of Medicine, 121, 748-757.
type 2 diabetes: Prevalence, incidence, and risk factors. ham study. American Journal of Cardiology, 34, 29-34.
nardo Study. Diabetes Care, 21, 1236-1239.
glycemia, and 22-year mortality in black and white men. stry Study. Diabetes Care, 20, 163-169.
the American College of Cardiology, 21, 920-925.
bolysis in Myocardial Infarction (TIMI) trial, phase II. ronary angioplasty. Circulation, 91, 979-989. 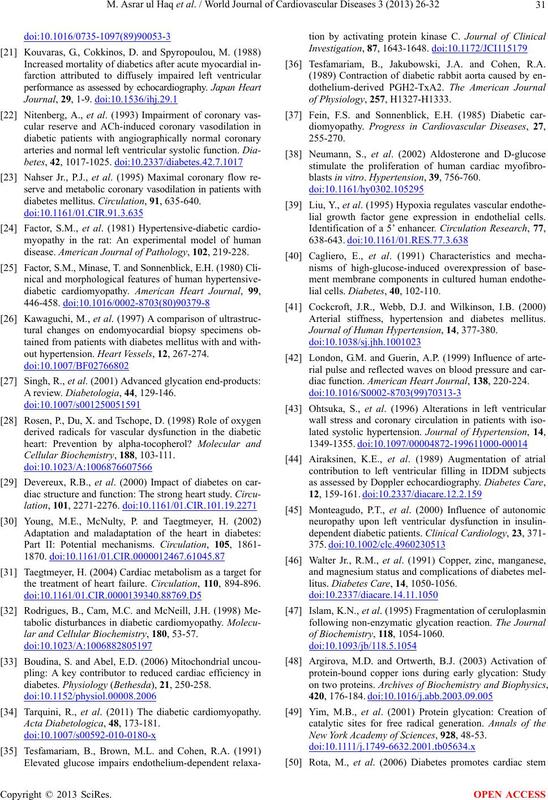 American College of Cardiology, 14, 49-57.
diabetes mellitus. Circulation, 91, 635-640.
disease. 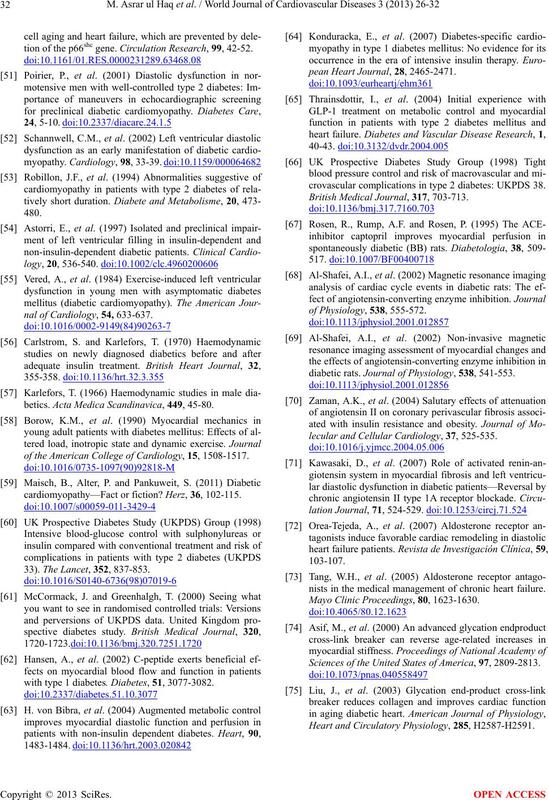 American Journal of Pathology, 102, 219-228.
out hypertension. Heart Vessels, 12, 267-274. A review. Diabetologia, 44, 129-146.
the treatment of heart failure. 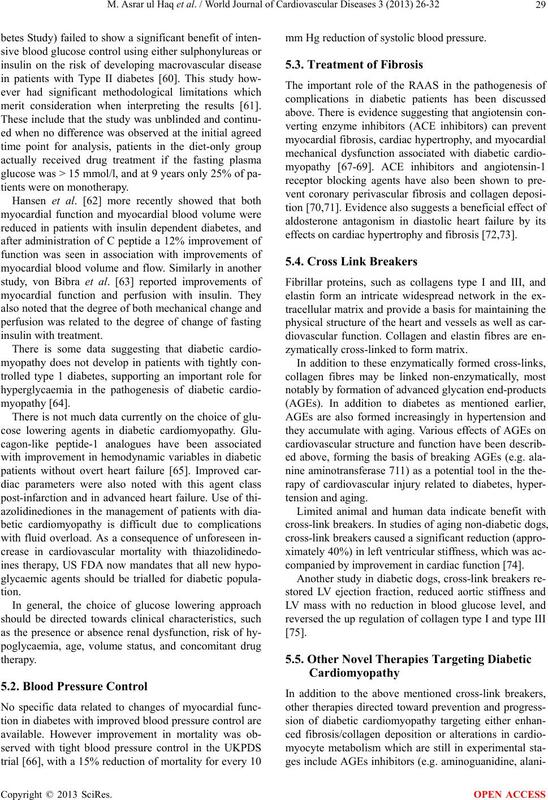 Circulation, 110, 894-896.
lar and Cellular Biochemistry, 180, 53-57.
diabetes. Physiology (Bethesda), 21, 250-258. Tarquini, R., et al. 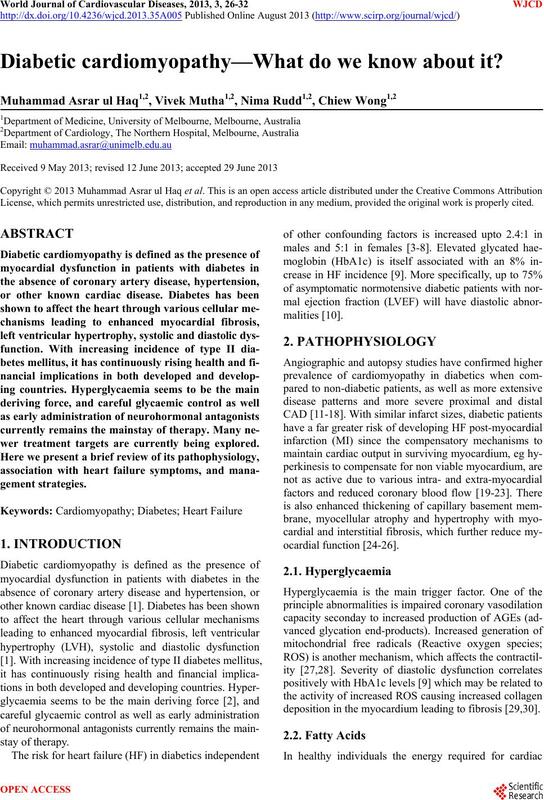 (2011) The diabetic cardiomyopathy. Tesfamariam, B., Jakubowski, J.A. and Cohen, R.A.
blasts in vitro. Hypertension, 39, 756-760.
lial growth factor gene expression in endothelial cells. lial cells. Diabetes, 40, 102-110. 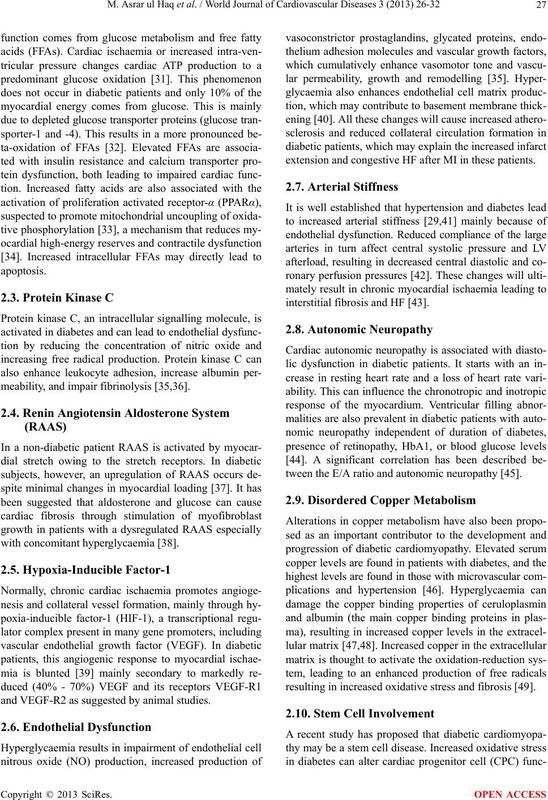 Arterial stiffness, hypertension and diabetes mellitus. Journal of Human Hypertension, 14, 377-380.
diac function. American Heart Journal, 138, 220-224.
litus. Diabetes Care, 14, 1050-1056.
of Biochemistry, 11 8, 1054-1060. New York Academy of Sciences, 928, 48-53.
tion of the p66shc gene. Circulation Research, 99, 42-52.
nal of Cardiology, 54, 633-637.
betics. Acta Medica Scandinavica, 449, 45-80.
of the American College of Cardiology, 15, 1508-1517.
cardiomyopathy—Fact or fiction? Herz, 36, 102-115. 33). The Lancet, 352, 837-853.
with type 1 diabetes. 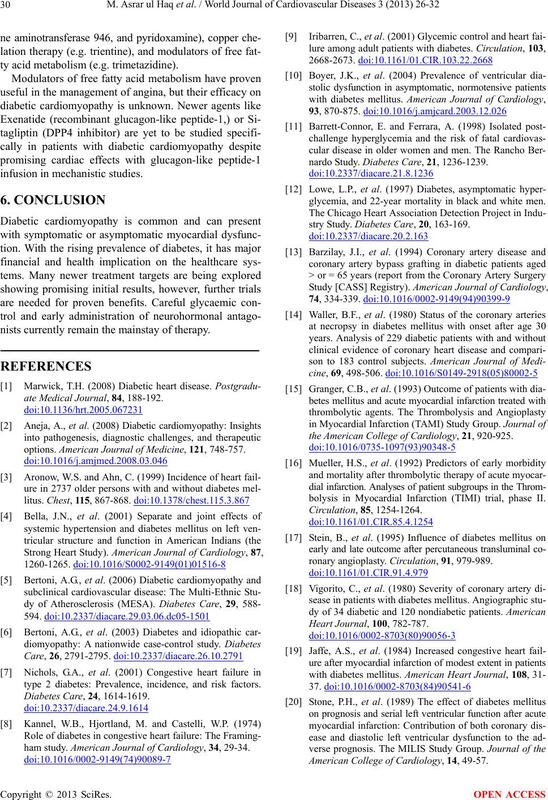 Diabetes, 51, 3077-3082.
pean Heart Journal, 28, 2465-2471.
crovascular complications in type 2 diabetes: UKPDS 38. British Medical Journal, 317, 703-713.
diabetic rats. Journal of Physiology, 538, 541-553.
lecular and Cellular Cardiology, 37, 525-535.
nists in the medical management of chronic heart failure. Mayo Clinic Proceedings, 80, 1623-1630. Sciences of the United States of America, 97, 2809-2813. Heart and Circulatory Physiology, 285, H2587-H2591.